We offer Transition Fittings that provides great pull-out strength than the PE tubing to which they are connected. These ensure positive seal and therefore can be used ideally for Gas industries. We provide high strength and well designed Transition fittings. We offer Stainless Steel Transition Fittings to our client. We are the leading manufacturer & exporter of ss transition fittings. 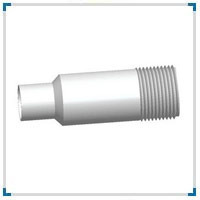 These fittings are available from us in numerous dimensions and specifications that suit the requirements of varied industries. For more details kindly contact us. We are the Authorised Dealer for + GF + make PE Electro Fusion Fittings. We are a remarkable entity in this domain, engaged in offering a qualitative assortment of Transition Bushing. Jai Shiv Shakti Pipe & Sanitary Ware Trading Co.
Our company has set benchmark in providing CPVC Transition Bush. We offer Reduction-TEE-PN-25 with features of high resistance to corrosion and abrasion.